This weekend our family took the first of our annual trips up to our local farms. 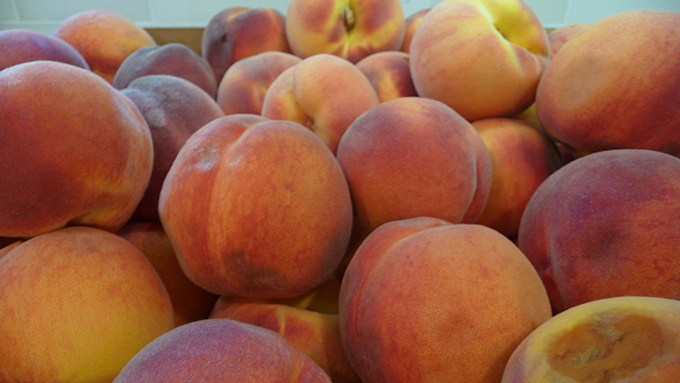 It's peach season and we are already a week behind! If you grew up in a family like mine then you had a home canned fruit or vegetable at your table a minimum of once a week. We enjoyed the "fruits" of my mothers labor. Although I do remember my sister saying a time or two how much she HATES snapping beans. Ah, lovely memories. We began our canning season this year with green beans grown from our garden. Passed down from my mother, we only grow Royal Burgandy Beans. Our first house being the size that it was didn't take us too terribly long to remodel. Only about 2.5 years of doing almost everything ourselves and we were the proud owners of a renovated home. Here is a photo rundown and each space before and afters. I'll throw in some exterior for your viewing pleasure too. We'll start with the entryway. Haha..yeah right, entryway, more like a spot stolen from the living space to be a mock entry. Our first house was my mine and my husband's very first adventure together. We moved into the house as soon as we returned from our honeymoon and the work never stopped from there. We had been looking for a house for weeks before we got married. Our "financial situation" left much to be desired but buying a house just seemed like the right thing to do at the time. We would find one we really liked but then would be just out of our reach for one reason or another. This is the beginning of yet another project. I tend to use the phrase one project at a time, but the reality is that at any given time, I have many projects going at many different stages. My favorite project of all however, is learning how to be a mother. First and foremost this is what I am always working on. There are many ups and downs in parenting and each is a learning process. I once heard in a talk that we should be thankful for the thorns in our life. Without them we could never be as beautiful a rose as we should be.